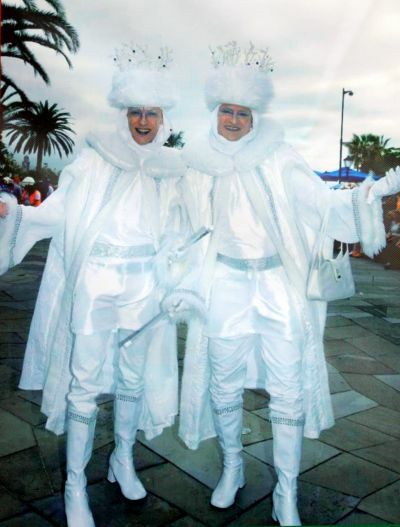 Is German carnival Tenerife Puerto de la Cruz the end of a happy era? German Carnival Tenerife is known in Germany as Karneval auf Teneriffa. It has been a much loved feature of the so called Düsseldorfer Fifth Season for a long, happy era. Needless to say, the German founder of Loro Park always paid a warm welcome to every Düsseldorf Prinzenpaar, year by year. 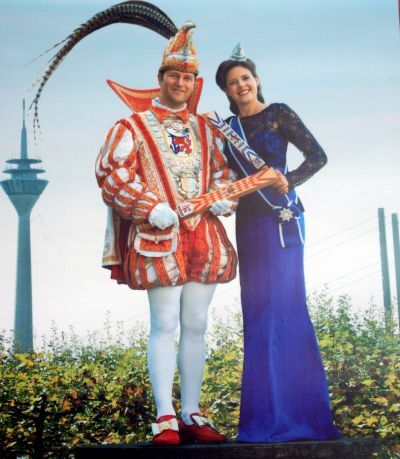 A Prinzenpaar in this context is a German royal Carnival couple. Portrayed is one with Prinz Thomas II and Venetia Anke during the Puerto Cruz Coso Apotheosis of 2012. Great news for the Puerto Cruz Düsseldorfer friendship. In February 2017, the friendly international Carnival alliance of the two towns celebrated its 45th anniversary. 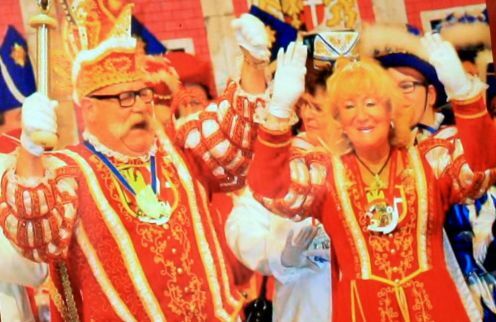 It was also the year when the Puerto de la Cruz Carnival was very happy to receive a mayor of Düsseldorf again. It was Thomas Geisel. This happened after Joachim Erwin was Puerto's last guest in 2003 and no others had come for many years. The early hour Hoppeditz funeral would allow a Düsseldorf Prinzenpaar to attend the Sardine cremation at night. This may not always be practical, though. Nobody knows any more who exactly set the ball rolling for the Düsseldorf LTU airlines to start to sponsor it in the Seventies. That's when the big winter exodus to Tenerife by German tourists took off by air. 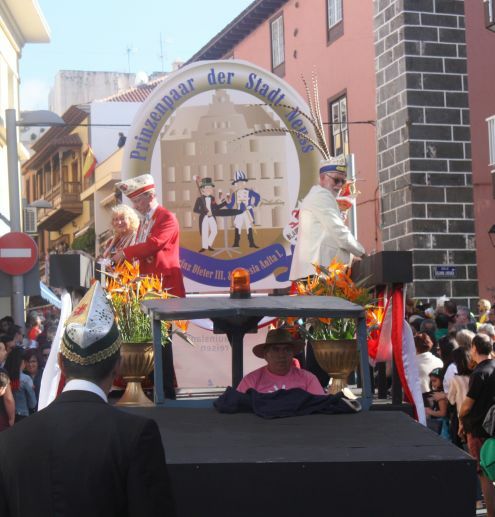 German Carnival Tenerife and its friendship with Puerto de la Cruz were beating all records by 40 years and peaked in Germany in 2013. 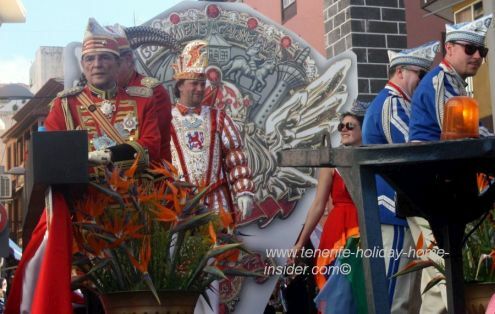 That's when the last Tenerife Reina de Carnaval (carnival queen) was celebrated in the leading city by the Rhine. Video with important facts of German Tenerife Carnival Puerto Cruz 2012. What difference to Puerto de la Cruz Carnival does the video reveal? Unfortunately, LTU stopped its flights. Eventually Air Berlin was the last sponsor on a large scale for the German royal Carnival friendship from the right hand side of the Rhine. The Air Berlin sponsorship had been displayed on the Düsseldorf carnival float for many years. 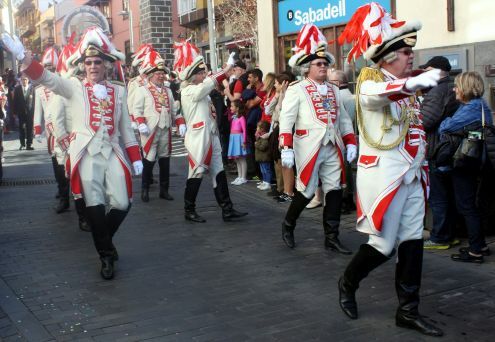 What was the sudden problem for the Carnival organization's coming to Tenerife? On February 18, 2013, Köln Neuss the rival from the other side of the mighty river steps in as an alternative with a somewhat smaller group. The 'Düsseldorfer Jecke' had decided to go to Berlin, instead. German Carnival Tenerife scene of 2013. The photo above shows Neuss Karnaval Prinz Toni Weber and Novesia Annelie Weber Debre which is Loro Park history. However by the looks of it, German carnival in Puerto de la Cruz is there to stay. Why? Karneval delegations from the towns Düsseldorf, Neuss, Mönchengladbach, Vechta and Eschborn were invited at the Puerto de la Cruz Town Hall at 20.00 on March 02, 2017. Depicted above is part of the carnival float from Düsseldorf. On top are its charming Prinzenpaar Prince Christian III and Princess Venetia Alina. 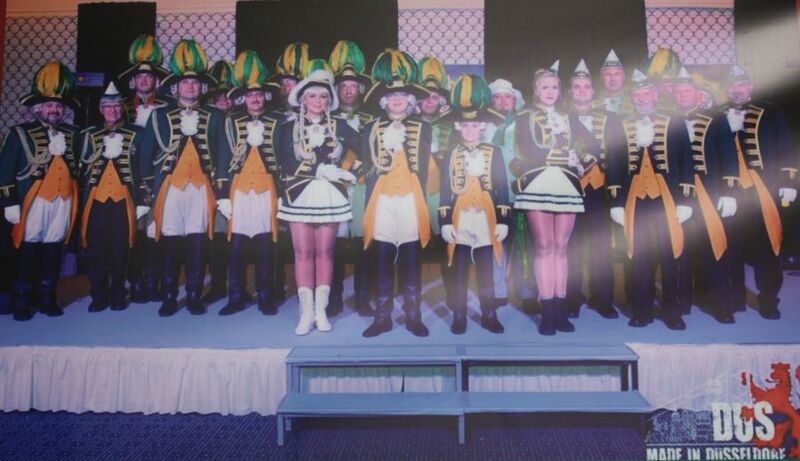 It remains to wonder who the handsome Carnival General is that stands in the front. His richly adorned red uniform with medals would make any military man most happy. It's not the German mayor Thomas Geisel who was watching the parade from an elite location. 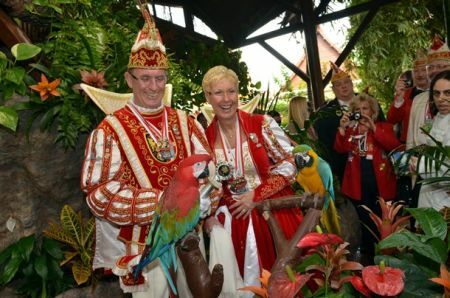 Fastnacht 2016-2017 visitors in Tenerife. Neusser Jecke in Puerto de la Cruz in 2017. Outgoing Jecke from Neuss by Düsseldorf greeted bystanders with a friendly "Helau" the German Düsseldorf Carnival salute. They were closely followed by the Neuss Karneval Prinzenpaar. They graciously spoiled bystanders by throwing masses of Candy sweets down into the street. Such exercise would have warmed up the Puerto de la Cruz Reina Infantil the little girl queen of 2017. She was shivering in her carnival outfit when I saw her in the semi shade before the parade started. Neuss Karneval in Puerto de la Cruz with its float in 2017. Most probably, the Kamelle (candies) thrown from Düsseldorf floats like the one from Neuss won't become Nostalgia in Puerto de la Cruz the oldest Tenerife resort. The video is by the Tenerife Holiday Home Insider. It shows how sweets are thrown into the crowds by the wayside by Venetia Sabine the Carnival Princess of 2019 from Düsseldorf in Puerto de la Cruz. Prinz Martin I is hidden behind her, unfortunately. Also, the distribution of Carnival medals by the Germans and their flag at the Puerto town hall will remain a precious momentum. These traditions will remain highlights like Puerto's Gay Marathon. The 'Tuntenlauf' a 'gay parade' or one that makes fun of some gays is now part of German carnival in Dusseldorf. It resembles the Mascarita Ponte Tacon of Puerto de la Cruz. Carnival costumes become extraordinary street art by this single carnival event of a gay parade. Of course, it will live on. Why? It's so 'jeck', as they would say in Dusseldorf, hence so hilarious. The German Carnival Bar Köpi near Lago Martianez. The Bar Köpi the yearly hangout of the Düsseldorf carnival delegation will also survive. It's still there on Corner Calle Venezuela and former Avda. Generalisimo now Familia Bethencourt y Molina. Its delicious 'Matjes Heringe with Bratkartoffeln' should keep on drawing German dinner and lunch guests or those that come for a fast snack. Then, there are the charming manager and Königspilsner beer, of course. As not to forget, a Puerto Cruz Carnival delegation of seven persons will attend the coming Düsseldorf Karneval for one week, as is custom. The Tenerife adult as well as the Infantil Reina del Carnaval of 2017 will be part of the group. 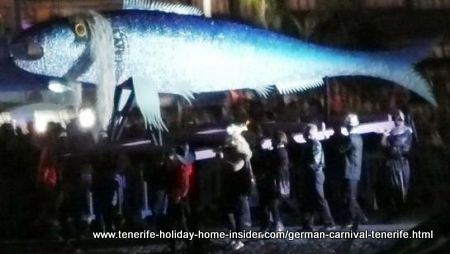 From German Carnival Tenerife back to Tenerife attractions carnival where links for many more interesting carnival topics are found.